The SATO MB4i, 4"direct thermal mobile printer, is designed for everyone in mind. Weighing 960g (with battery), you can carry it wherever you go. 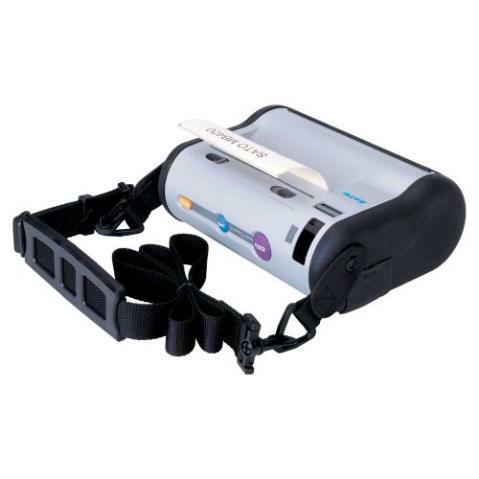 Simply clip it onto your belt (belt clip provided for) or sling it across your shoulders using the rugged shoulder belt that protects the entire printer from harsh rain and other weather conditions. With "simplicity" in mind, we have even designed for simple label loading: simply open up the loading compartment and slot in the label roll. In addition, the MB series also offers 2-colour printing. The built-in support for RS-232Cand IrDA lets you control the printer through a wired connection and optional interface likes Bluetooth and 802.11b Wireless LAN enable wireless printing with mobile wireless devices such as PDAs or handy terminals. Best of all, you can choose to print on direct thermal labels (either the continuous mode or the peel off mode), liner-less labels or receipt paper. The new SATO MB Series - it goes wherever you go!